World Food Program USA President and CEO Rick Leach, left, and Steven Hadley, who served as national security adviser to President George W. Bush. “A bottom-up approach to agricultural policy and regulation is necessary to bridge the needs at the farm with the requirements of the market,” Kuhlmann said. Food security in developing countries is so vital it requires a "whole of society" approach, but President Donald Trump's administration is unprecedented and hard to figure out, Stephen Hadley, the national security adviser to President George W. Bush said. 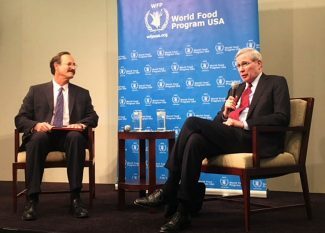 Hadley was the speaker at the annual Samuel Berger lecture Dec. 18, sponsored by the World Food Program USA, a private sector group set up to support the United Nations World Food Programme. In a conversation with WFP USA President and CEO Rick Leach, Hadley noted there is a strong link between food insecurity and "the couple dozen" fragile states that are the cause of the bulk of the terrorism, refugees and poverty in the world today. "If people don't see a better life they will be susceptible to the siren song of terrorism," said Hadley, who chairs the U.S. Institute of Peace, a nonpartisan organization set up to promote national security and global stability by reducing violent conflicts abroad. The United States, he said, does not have "a comprehensive approach" for dealing with the problem of fragile states which have been unable to provide government services and have lost the confidence of their people. "We can use the military, but we are not so good at coming in behind and helping those states rebuild themselves," he said. "We can't build another nation. The people of that nation have to do it," Hadley said, but signaled that he believes the United States can be supportive. If the fragile states are not dealt with "in a systematic way," he said, the number of displaced people will grow from the current 60 million people to a much larger number, which will "exhaust the spirit of generosity of the people in the world." The United States needs to help "clear away the terrorists," then feed people and then help develop their agriculture, he said. "We need to think systematically about food, water, energy and the environment," he added, explaining that he fears experts are divided into "stovepipes." The problem is so big and so important, Hadley said, it needs a "whole of society" approach that includes nongovernmental organizations, universities and business as well as government to succeed. He did not say how such an effort would be organized. Asked by former Agriculture Secretary Dan Glickman how he views the Trump administration, Hadley noted he was not part of the Trump campaign or the transition, and has never met President Donald Trump. "This is an administration like we have never seen before," Hadley said. There have been political insurgencies and populists in the past, he added, "but they have never captured the White House." The Trump insurgency, he noted, has brought into the government people who don't like government, and the transition from campaigning to governing has been unusually long. "This tumult, this disruption is what Donald trump is and that is the new normal," Hadley said. "There are lot of challenges (with) a president who likes being a disrupter. He is a tough president to serve." Hadley also said it is hard to figure what is going on inside the State Department. Secretary of State Rex Tillerson believes he is doing the right thing in reorganizing the department, Hadley said, but "we are going to lose a lot of good people in the process." It has been very hard to fill positions in this administration because so many foreign policy experts signed "Never Trump" letters, he said. Trump, he noted, did not have a lot of background in foreign policy. In office, he said, the president has relied on the instincts that got him elected, but he has run up against "the realities" of Congress, his own advisers and world events. Asked by a young member of the audience if the internet and new forms of business and communications can succeed where institutions have failed, Hadley said he encourages all kinds of innovation, but "be careful of a society without institutions. Be careful about getting rid of these institutions." Trump was used to being able to run a company when he bought it and thought he could run the country that way, Hadley said, but is finding that other institutions including the states, U.S. companies and the courts are challenging him on issues such as a climate change. "It is a test of our institutions," Hadley said.